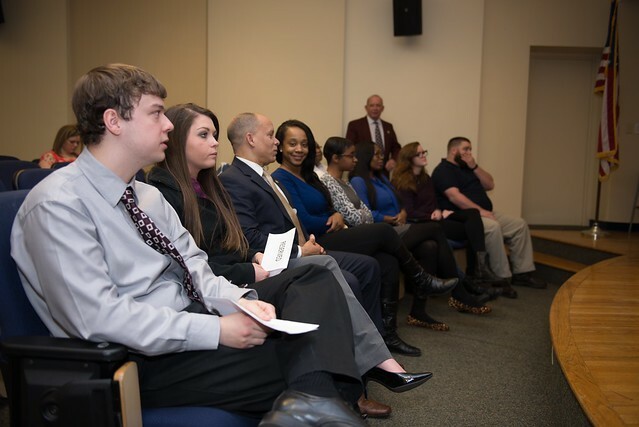 Point Park University inducted the following 11 students April 14 into its Alpha Phi Sigma Alpha Eta chapter, a nationally recognized honor society for criminal justice and forensic science undergraduate and graduate majors. At the induction ceremony, students received honor cords, certificates and pins from Michael Botta, M.S., chair of the Department of Criminal Justice and Intelligence Studies; Richard Linzer, J.D., interim director of the M.S. in criminal justice administration program; and Sean Elliot Martin, Ph.D., full-time instructor of criminal justice and intelligence studies. "The students inducted represent not only exemplary academic achievement, but also a strong commitment to the criminal justice profession and service to society," remarked Linzer. According to Linzer, membership in Alpha Phi Sigma is founded on four ideals - academic excellence, leadership, service and unity - and each member accepts and commits to these ideals. "To me, being inducted into the honor society represented the past, the present and the future," said Logan, who earned his B.S. in criminal justice in 2015 from Point Park and is currently pursuing an M.A. in global security and intelligence. "I was following in the footsteps of past students who had walked this same road but I was in the present moment with my fellow classmates looking to the future as we will all soon move on to become future leaders," Logan explained. As chief of county detectives for the Allegheny County District Attorney's Office, Logan said he uses the education and knowledge he has obtained from Point Park to supervise, teach and direct his employees. Huttenhower, a senior criminal justice major, plans to become a Pittsburgh Police Officer following graduation, and eventually, a narcotics special agent for the FBI. Hansom, a senior criminal justice major who transferred to Point Park in 2014, plans to pursue a career in computer forensics. "My experience being inducted into this honor society was amazing because I worked so hard to get my grades together," said Hansom. "Point Park has helped me a lot."